Scientists at the University of California, Berkeley just released a free Android app that uses smartphone accelerometers to detect earthquakes — and it could potentially warn users of upcoming seismic activity. The app, called MyShake, is available on the Google Play store and runs on minimal power in the background, so users will hardly even know it’s there. An iPhone app is currently in the works. The app works by analyzing the data from the phone’s accelerometers to see if it fits the vibrational profile of an earthquake (rather than, say, the shaking of your body as you go for a jog). If the data seems to indicate a quake, the information is automatically relayed to the Berkeley Seismological Laboratory, along with the phone’s GPS coordinates, for further study. While right now the app is only able to record seismic information, in the next year the team behind the app is hoping to use it to warn people near quakes that shockwaves are headed their way. It’s important to note that smartphone sensors are no match for in-ground seismometers, and they aren’t able to pick up on minor shaking. What they can do is detect earthquakes above a magnitude 5, which are the quakes most likely to do real damage. The range of these sensors is farther than you might expect — they’re able to sense quakes up to 10 kilometers away. While MyShake is no replacement for traditional seismic networks like the one run by the US Geological Survey, it could provide a vital resource in earthquake-prone regions without such networks. For example, Nepal and Peru have no early-warning system and few sensors to detect quakes. With over a billion smartphones in use worldwide, the amount of data scientists could potentially collect is staggering. By crowdsourcing the information, people in these areas would have a few vital seconds to prepare before a quake hits. MyShake is not the first app of its kind, but other earthquake monitoring applications haven’t been widely adopted because they tend to consume lots of cellphone power and data. 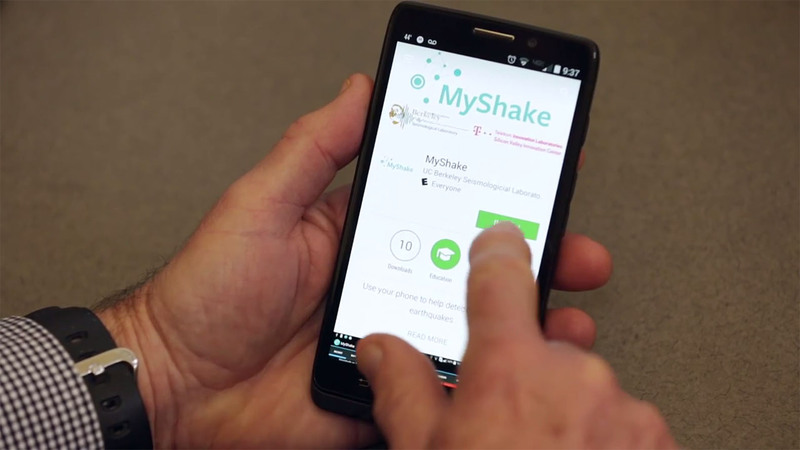 Because the app only pushes data when it detects a quake, MyShake is much more practical for everyday users. The team is hoping that their approach proves so useful that it might be eventually adopted as a built-in part of Android and iOS. The new app from the University of California, Berkeley uses a network of smartphones to track earthquakes around the world. While the app only collects data for analysis now, within a year, researchers hope to be able to predict quakes and give people nearby an early warning to take cover.